This is an extremely complex instrument used in a variety of operations. On its upper part are an astrolabe and a geographical mirror, on which the name Hans Christoph Schissler jr, is engraved. This was the son of the more famous instrument maker. On the base of the instrument is a compass which can be oriented horizontally and which bears a calendar on the external surface of its base. The instrument is also equipped with an alidade which has a graduated scale for measuring height and a pendulum which serves as a level. 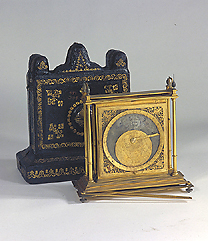 The whole instrument can be contained within a leather case with golden decorations.